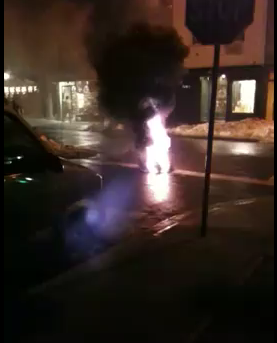 This video of an exploding manhole in New York City, shot by YouTube user dbs176, is making its rounds online sparking a debate on how something like this could occur. As it turns out underground cables carrying electricity can become damaged from aging, corrosive chemicals, or hungry rats. Up to 13,000 volts running through the cables heat up their rubber insulation, made of paper and lead, smoldering the coating causing it to catch on fire and release gases. The electrical wires begin to spark and ignite the gases, and along with built up pressure from within the manhole, cause a powerful explosion which can launch a 300 lb. cover several feet in the air.